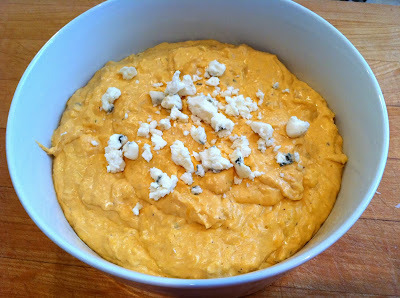 If you are looking for a crazy delicious addictive dip for your next game day spread, look no further. People go crazzzy for this quick and easy appetizer. All the flavors of what we love about hot wings are right here. It doesn't look the prettiest but trust me it's really good and will disappear fast. Make this ahead of time and take it to your tailgate in a tinfoil pan and heat it right on the grill. In a medium sauce pan, melt the cream cheese over low heat and than add all other ingredients and mix well for about 10-15 minutes until all the cheeses are melted and nice and hot. Pour into a serving dish and sprinkle the blue cheese crumbles on top. Serve with tortilla chips and watch this addictive dip disappear!